Reset oil service light Pontiac Bonneville. From years: 1985, 1986, 1987, 1988, 1989, 1990, 1991, 1992, 1993, 1994, 1995, 1996, 1997, 1998, 1999, 2000, 2001, 2002, 2003, 2004, 2005. How to reset oil service light Pontiac Bonneville. From year: 1985, 1986. Rotate the key in the ignition to On/RUN, do not start the the vehicle. Press & release the SERVICE REMINDER button until the desired item indicator it shows on the display. When the desired indicator item it shows on the display, do not release SERVICE REMINDER button. After button has been pressed for approximately 13 seconds, the service interval mileage display will begin a countdown in 500 mile/km intervals. When desired service interval mileage is reached, release button. Rotate the key in the ignition off position and then start your Pontica Bonneville to verify the indicator has been reset. Reset oil service light Pontiac Bonneville. From years: 1987, 1988, 1989, 1990, 1991. Rotate the key in the ignition to On/RUN, don’t start the car. Depress & release the SERVICE REMINDER button until the desired maintenance light item is show it on the screen. When the desired maintenance light item is displayed, do not release SERVICE REMINDER button. After button has been pressed for nearly 12 seconds, the service interval mileage display will begin to count down in 500 mile/km intervals. When desired maintenance light indicator service interval mileage is reached, release button. Rotate the key in the ignition OFF/LOCK and then start your Pontiac Bonneville to verify the maintenance light indicator has been reset. How do you reset oil service light Pontiac Bonneville. From years: 1996, 1997. Switch the ignition to RUN/ON, but the engine is not running. Hold the RESET button for 7 seconds. When a Driver Information Centre (DIC) message of RESET is show it on the monitor and the oil life index equals 100%, the reset is complete. Rotate the key in the ignition to off/lock position and then start your Pontiac Bonneville to verify the maintenance light has been reset. How can you reset oil service light Pontiac Bonneville. From year: 1998. Switch ON the ignition, don’t start the engine. Press the TRIP button on the Driver Information Centre (DIC) switch to view various menu choices, stop on OIL LIFE REMAINING message. Depress & hold the RESET button on the Driver Information Centre DIC switch for more than approximately 5 seconds. The oil life will change to 100%. The engine oil life warning light monitor is now reset. Turn OFF the ignition and then start your Pontiac Bonneville to verify the maintenance indicator has been reset. Full procedure how to reset oil service light Pontiac Bonneville. From year: 1999. Switch RUN/ON the ignition, don’t start the engine. Press & hold the OIL RESET button in the glove box for at least 6 seconds, but no more than 60 seconds. 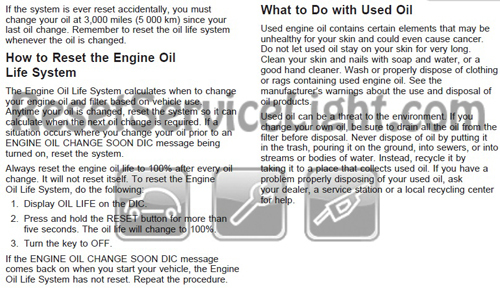 After 6 seconds, observe the CHANGE OIL SOON maintenance light flash 4 times before light goes off. 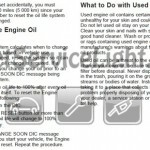 This indicates that the engine oil life maintenance light system has reset. Turn OFF the ignition and then start your Pontiac Bonneville to verify the maint indicator has been reset. Reset oil service light Pontiac Bonneville. From years: 2000, 2001, 2002, 2003, 2004, 2005. Turn the ignition to run/on position, do not start the vehicle. Display the oil life maintenance light index on the Driver Information Centre (DIC). Press & hold the RESET button for more than 7 seconds. The oil life indicator must change to 100%. Switch the ignition off and then start your Pontiac Bonneville to verify the oil warning indicator has been reset. If the ENGINE OIL CHANGE SOON DIC message comes back on when you start your Pontiac Bonneville, the Engine Oil Life System has not reset. Repeat the procedure. All information how to reset oil service light Pontiac Bonneville is taken owner’s manual. That it is the full procedure how to reset oil service light Pontiac Bonneville. If you like to reset any maintenance oil light after an oil change. Or reset check engine light, airbag light, inspection key or insp errors when maint reqd, for Pontiac cars. Or any warning light for service reminder which appears on the display. Write in the search box the car name for which you want to find information, and find how to reset other service reminders by yourself.